Product #45941 | SKU XEVA-405PROTEC | 0.0 (no ratings yet) Thanks for your rating! 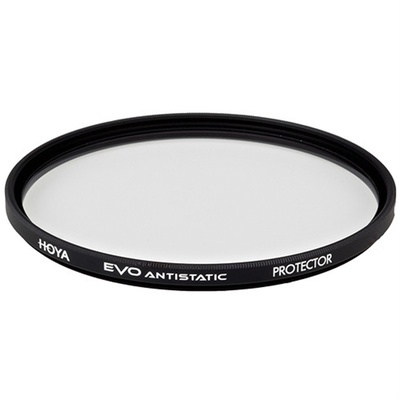 The Hoya 40.5mm EVO Antistatic Protector Filter is a simple, clear filter designed for general protection for your lens. This optically clear filter does not affect the overall image quality while helping reduce dust, scratches, moisture, and other elements from damaging your lens. The EVO antistatic coating on this filter helps to repel dust, as well as water, scratches, and stains, and aids in making the substrate easy to clean. Additionally, a 16-layer Super Multi-Coating helps to reduce surface reflections and ghosting for maintained contrast and clarity. The optical glass filter is set within a one-piece low-profile aluminium ring, which lessens the likelihood of vignetting if used on a wide-angle lens. The ring also features front threads for attaching additional filters or lens caps. EVO antistatic coating helps to repel dust and is also water-, stain-, and scratch-resistant. Additionally, this hardened coating is also easy to clean in order remove smudges or fingerprints. One-piece aluminium filter ring features a low profile to reduce the likelihood of vignetting when used on wide-angle lenses. Additionally, this ring incorporates front 40.5mm filter threads for stacking additional filters or attaching lens caps.